A glimpse at the weekend workshop I led. Photo by Alessia D'Urso, Girls In Tech UK Board Member. London has a staggering number of events for coders. It's awesome. The only thing is, I've gone to a lot of events, and I can count on one hand the number of times a technical discussion—about a tool, an industry standard, or the craft of code—was led by a female. For the majority of the events I attend, I am one of only two or three females in attendance. I decided that this year, if I want to see more women presenters, I need to step up. I need to talk at an event. As if the universe was listening, two events came up this spring that got me more excited and less nervous about going for it. 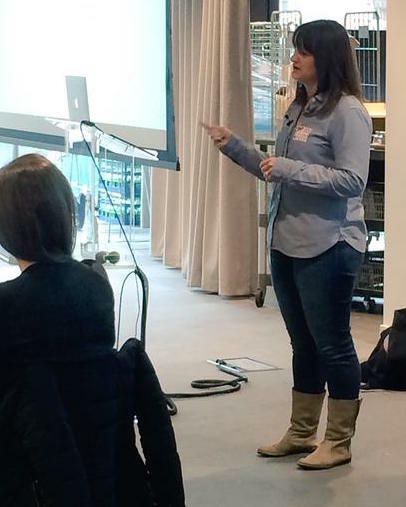 First, Ladies Who Code London ran a workshop on public speaking, and it was hosted here at Red Badger. Trisha Gee and Mazz Mosley were wonderful. Their message was simple: it gets easier each time you do it, and there are ways to work through nervousness. They also emphasized that the audience is rooting for you--everyone in the room wants to see you succeed. Pretty nice, right? Then I had the chance to attend the Women Techmakers Summit, an evening celebrating International Women's Day that was organized by Google Women Techmakers and Women Who Code London. There was a series of speakers and panelists, and every presenter had a powerful message. The speaker whose message stayed with me most was the keynote, Margaret Hollendoner. Margaret said she sometimes makes her career sound like it was all "right place at the right time" luck. But she told us it wasn't that simple. Every opportunity was lucky in one sense, but the opportunity wouldn't be there without her hard work. She also emphasized that deciding to say "yes" required confidence and bravery. Margaret's presentation gave me another nudge: get past my fear and present at an event. GeekGirlMeetup and Girls In Tech. Lora asked if I was available to teach--the original instructor had to back out, and they were looking for a replacement. It sounded like my lucky chance, so I agreed. Then I got all the details. I was going to be the only teacher for 12 hours of instruction over two days. I'd be teaching at Twitter headquarters to an audience of 100 people. I felt pretty panicked, so I knew it was time to make some lists. I'm not an expert in web development. I've only been doing this stuff professionally for a year and a half. I won't be able to answer all their questions. 12 hours is a long time. 100 people is a lot of people. I'm not an expert in web development. I still spend most days learning new things. I know what it's like to feel confused and lost. And I know how to recognize and celebrate small triumphs. I did set that personal goal. Those nice ladies did tell me the audience will root for me. That other nice lady did say you need to take advantage of luck that comes your way. If I'm going to teach 100 people for 12 hours, this is the ideal audience. Eager learners who, by choice, agree to a weekend in front of a computer taking in as much as possible. I decided to go for it—butterflies, sweaty palms and all. Make techy code stuff seem less scary. Make people feel ok about asking questions. Saturday morning arrived, and I had a rough start. I spent the first session working out how to use the mic and the two screens floating on either side of me. My notes weren't loading like I hoped. The Internet was down. My demo wasn't working even though it worked mere hours before. I was shaking. After the first demo fell flat on its face, I knew I needed to stop. I took a few minutes to get everything running properly. I got water. I took some deep breaths. Those minutes felt like ages, but it was worth it. When I started up again, stuff finally started working. The first day flew by. A few folks came by during breaks to say they were enjoying themselves. At the end of the day, lots of people came by to say thanks. Were my silly jokes working? Did my missteps when typing—forgetting a closing bracket, leaving off a semicolon, incorrectly specifying a source path—help people understand that breaking and fixing things is what this job is all about? During the second day, people from all over the room were asking questions. Tables were helping each other debug and understand what was going on. Breaks came and went with people staying at their seats to try things out. I couldn't have hoped for more. I have so many ideas about what I'd change if I could do it again. I missed some concepts. I glossed over others. But I did it, and I had an amazing time. If you're tempted to give a talk or run a workshop, please go for it. It's scary but great, and you have a wonderful community rooting for you. Red Badger is always looking for ways to connect to the tech community. Like that sound of that? Then come join us.